Before I go into details of the reviews, allow me to share my underarm experience with you, my beautiful readers, although I assure you that the underarm is not mine in this case. This happened during the days when I was still working in a cafe (And damn! I make the best coffee among my colleagues *smirk*). 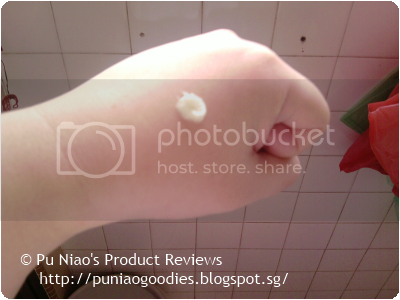 When I was still a student, I do not believe in underarm products. I mean, at the end of the day, just go shower and scrub thoroughly all over. And bingo! Sweat is gone, just like that. And fast forward a few years later when I started working in a cafe. One fine day during a middle of a crowd-fest due to it being a weekend, after I "bullied" a co-worker in doing the cashier counter while I took over the barista machine. These 2 girls came up to the counter admist a long queue that never seems to end. I'll just graciously skip their races, but the thin one, let's call her Miss. T (T for Thin) while the chubby one, we shall call her Miss. C (C for Chubby). While my cashier counter-colleague was attending to her and oblivious to the surroundings, Miss. C decided to "secretly" scratch her left armpit (which unfortunately is the direction where I'm hovering at my barista machine). And god forbid! Her armpit were so dark with sweat stains. And right after scratching the itch in her armpit, Miss. C decided to sniff the same fingers that she used to scratch that armpit of hers. Gross, right? And she actually pretended that none of that happened at all. She just looked around casually, just to make sure no one saw her do that. Until she caught my eye. No doubt, my face was rather scrunched up from that unsightly episode, but my facial expression kinda told her that I did witness that horrifying episode. Needless to say, that same day after I knocked off from work, my first decision is to walk into Watsons and hunt around for some underarm products to ensure I do not have sweat-stained armpits. Ever! Wakilala Clear Wash: Bison Wakilala Clear Wash is an exfoliating and whitening product specially formulated for use on underarms. Product disinfects, whitens and removes underarms dark patches and marks. User experiences a cooling, refreshing sensation after application. VERDICT: Personally, I used an old toothbrush that I kept separately from my actual toothbrush used for my teeth. Since the product insists that it be used before showering a.k.a before you wet yourself anywhere, especially the armpits area. So, I squeezed out a generous amount onto my old toothbrush and proceeded to brush my underarms for a good 1-3 minutes. Although the packaging stated to "scrub and massage till foam turns into a dark compound", luckily for me, mine didn't. Can see how much I scrub it everday, huh? My advice is not to scrub too hard, just enough to scrub/massage for 1-3 minutes without feeling like the skin on your armpit is going to drop off. Whether the foam turns dark or not, it doesn't matter, as long as 1-3 minutes is up, just stop! Then, carry on with your showering activities as usual. After I'm done with my usual shower routine, I did noticed that my armpit did lighten a little after a week's usage. It also helps if you do "take care" of your armpits on a daily basis in the shower though. Underarm stench is definitely gone. It's not like the stench goes off forever and never comes back. It still does. But at least there's Wakilala Clear Wash that actually gets rid of the stench for a certain amount of time that lets you feel like a normal human being without stinky underarms. WHAT I THINK: No stinky smell! WHERE TO REDEEM A SAMPLE: I do not think there is samples for this item. But, if you are still curious and want to try, you could share it with your siblings, by transferring maybe half of the contents into another re-usable plastic container if you're somewhat against sharing products meant for underarms due to bacteria reasons. 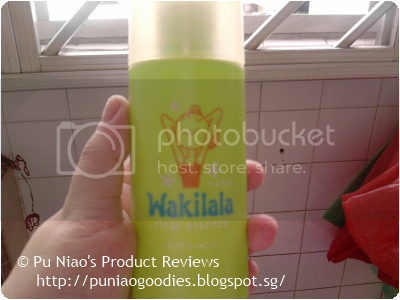 Wakilala Clear Essence: Bison Wakilala Clear Essence is a daily fast whitening and toning product for use on underarms. Product tightens pores & removes grime on underarms. Cooling sensation after application provides a refreshing effect. Help to reduce sweat & prevent smell from underarms. VERDICT: This is to be used after you have scrubbed your underarms with Wakilala Clear Wash. And seriously, like what the packaging has mentioned, there is this cool and tingling sensation when applied. (Please, do not use it on an un-scrubbed underarm as you will be wasting precious money.) That tingling sensation, of course, won't last 24 hours. But it's enough to make you feel as if you had clean, stink-free underarms from birth. TIP: If your underarm starts to stink once more, skip the Essence. Go back to scrubbing with the Clear Wash. Never, ever use the Essence alone. You will feel that cool tingling sensation. But the effect won't last if your underarm isn't clean in the first place! WHERE TO REDEEM A SAMPLE: Same as the Clear Wash, there isn't samples for this. Share with a family member, by transferring half the contest to your own re-usable bottle for prolonged use as well. anyway, Im gonna try this! I had doubts with products related to armpits, sometimes they said the product whitens, THEY DO, but peeling. SOoooooo glad i found your post! worries gone, buying 'em!